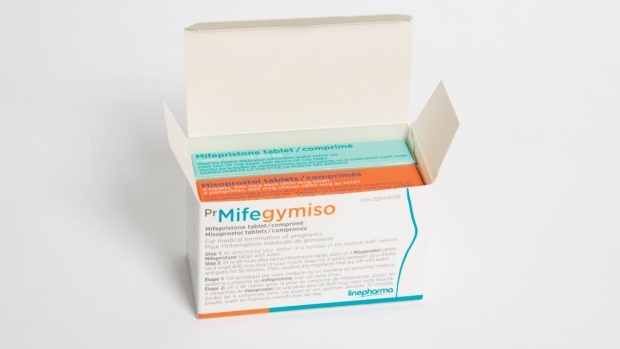 This file photo shows the abortion drug Mifegymiso, which is a combination of mifepristone and misoprostol. ST. JOHN'S, N.L. -- Newfoundland and Labrador -- the only province that does not provide at least partial coverage of the abortion pill -- is under renewed pressure to do so. "The government has a responsibility to uphold everyone's right to health and that includes access to abortion services that are comprehensive and accessible," Maggie O'Dea, a medical student at Memorial University who met with Haggie, said Wednesday. "We have such a rural and remote population that this is ultimately a huge potential win for the government to be able to provide that care and uphold their rights." "In (Atlantic Canada), it's been definitely a place where access issues have been quite acute," said Frederique Chabot of Action Canada for Sexual Health and Reproductive Rights. Chabot's organization has been monitoring the rollout of the drug across the country, and she said some provinces have been more effective than others at making the drug available. B.C., Alberta, Ontario, Quebec, New Brunswick, and Nova Scotia have implemented universal coverage, but some of these provinces still have restrictions. Chabot said the rallying from the medical community in Newfoundland and Labrador has been "quite wonderful to see." She hopes the provincial government will consider universal coverage along with a billing code, partnerships with medical colleges, and training and guidelines for practitioners, similar to what has been done in Alberta. Robin Whitaker, an anthropology professor at Memorial University who has studied abortion access in Newfoundland and Labrador, said consideration of the circumstances of patients in remote communities is often overlooked since abortion has been de-criminalized in Canada. "There's no criminal law on abortion in this country and that's a good thing, but politically sometimes there's still some hesitation," said Whitaker. Rolanda Ryan, owner of Athena Health Clinic in St. John's, said her clinic has performed 1,121 procedures since Mifegymiso rolled out at the end of January last year. Fifty of those used the drug -- 38 of them in 2018 as word of its availability spread. Ryan has worked with physicians in remote communities to prescribe the drug and says her clinic is happy to provide support to any practitioners -- including access to the 24-hour phone line required after taking the pill. "The universal access that was requested is like, gold standard, it's kind of the best thing you could ask for," said Ryan. "I don't know what they're ultimately gonna do, but ask for sky. Because why not?"